Walked past the pub today, and it's closed, with building work being carried out inside. 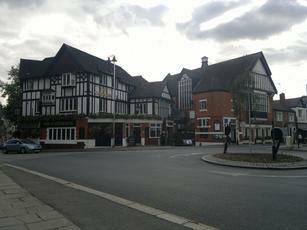 It's the 5th Wetherspoons pub that I frequent that has been, or is about to be, closed in the last month. All very popuar and always busy, so don't understand how they don't meet the Wetherspoons' business model. Feels like it's a personal vendetta against me ! I popped in last Friday afternoon, and had some reasonable fish and chips. 4 different pints of guest ales, at £ 3-05 a go. all quite jolly. and then I was told by several customers that this pub will no longer be a WSP after January 2016. The lease is running out , and WSP are not renewing, so there will be new owners. Therefore WSP will no longer have a pub in the Highgate/Hampstead area for the first time in quite a few years. Excellent Spoons. Lovely theatre upstairs. Pay a visit. Just to let people know , this pub is not a WSP conversion, as such. The original pub was built before 1914 and was called the George , my father remembered drinking there now and again in the 1970's. The dining room is the additional fixture. But nobody knows when the Beer Garden was built. years. The service is good but I always notice that the pub has a big turnover of staff.